Apple is forecast to have shipped a whopping 73 million iPhones over the 2014 holiday quarter on strong iPhone 6 demand, according to one well-connected analyst who also expects a busy start to 2015 for the company, with Apple Watch sales in March and a rumored 12-inch MacBook Air coming sometime before April. In a research note from well-connected KGI analyst Ming-Chi Kuo obtained by AppleInsider, Apple's latest iPhone 6 and iPhone 6 Plus models led a charge to 73 million overall unit sales for the quarter ending December. The analyst estimates the 4.7-inch iPhone 6 to hit more than 42 million, while the larger 5.5-inch iPhone 6 "phablet" contributed with just over 16 million unit sales. If the numbers hold up, Apple is in for a record-smashing holiday quarter. Kuo's estimates are well above expectations from other leading investment banks including UBS, which earlier this month forecast Apple to sell 69 million iPhones. Momentum from Apple's iPhone 6 lineup will spill into the first quarter, driving overall iPhone shipments to an about 61.7 million unit sales. A performance of that caliber would buffer seasonally slow sales. Consistent with the latest reports, Kuo also expects the highly anticipated Apple Watch to launch in March. While Apple has stayed mum on exact specifications, the company could fill in the blanks with a special announcement prior to the device's debut, the analyst said. Assuming a March launch, Apple Watch is expected to sell 2.8 million units in the first quarter, meaning those sales will be spread across a relatively short one-month span. Kuo says most component suppliers will see shipments in the 4 million to 5 million unit range through the March quarter, but a few manufacturers are seeing low yields on key parts, slowing down final assembly and shipping. 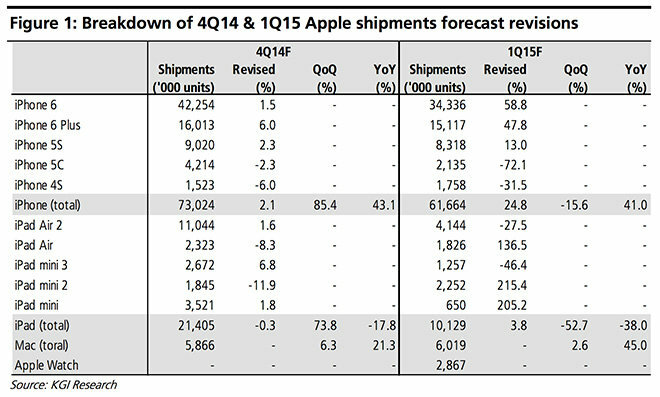 On Apple's rumored 12-inch MacBook Air with Retina display, Kuo is forecasting a ship-by date sometime this quarter. The all-new thin-and-light, said to sport a Retina display, ultra-thin form factor and Intel's latest mobile chips, will help fuel a 2.6-percent quarter-over-quarter increase in Mac shipments. Kuo expects Mac sales to hit 6 million units for the first three months of 2015, up slightly from 5.9 million forecast for Q4 2014. Aside from industry scuttlebutt, not much is known about Apple's ultraportable newcomer. A set of photos posted online yesterday purportedly show the laptop's display assembly, which boasts edge-to-edge glass with black bezels and eschews the usual translucent Apple logo for a polished insert more in line with the latest iOS devices. Finally, Kuo sees drooping sell through for iPad as Apple's recently released iPad Air 2 and iPad mini 3 models largely failed to move the needle during the holiday season. For the December quarter, estimates put iPad shipments down 17.8 percent year-over-year to 21.4 million units. Moving into the first quarter of 2015, iPad could hit 10.1 million unit sales, but the number is still weak, down 38 percent compared to the same time last year. Interestingly, Kuo models a rise in shipments for older iPad versions during the March quarter while at the same time revising down previous estimates of iPad Air 2 and iPad mini 3. The analyst adjusted his numbers to reflect challenges Apple's tablet is facing with shifting market headwinds.